Note: I am rebuilding this website. Here's a link to the old site. The 2037 was the middle loco in Lionel’s 027 line. 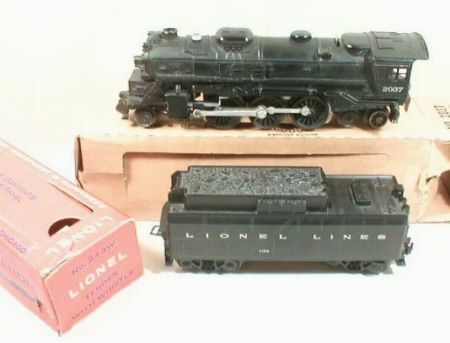 It’s one of the most common Lionel postwar steam locomotives. The 2037 is the same loco as the Lionel 2018, but with Magnetraction. Magnetraction is Lionel’s trademarked word for magnetic wheels. The magnetic wheels on locomotive provided additional pulling power, and kept the speeding locomotives on the track in tight curves. Until 1955 the 2037 came without a whistle. After 1957 the loco always came with a whistle tender. A pink version of the 2037 was cataloged as the 2037-500 in 1957 and 1958. The pink loco pulled Lionel’s famous girls train. This entry was posted on Monday, January 28th, 2008 at 9:33 pm	and is filed under Postwar O Gauge. You can follow any responses to this entry through the RSS 2.0 feed. Both comments and pings are currently closed. Copyright 2007 Terry Gibbs and IWantCollectibles LLC. All Rights Reserved.